As promised a while back, here I am with a gift guide series featuring small brands that have amazing products which would make unique gifts for loved ones. Today the brand I am excited to talk about is Elizabeth W, a unique small batch apothecary based in San Francisco. When I was looking around for interesting brands to feature in this series, Elizabeth W caught my eye for their elegant and simple packaging. I am a big fan of aesthetically packaged products, even if it is just a bar of soap 😀 There is nothing more delightful than gifting (and of course receiving ) beautifully packaged products! Elizabeth W started off as a perfumery and now they have incorporated their fragrances into a range of bath and body products, candles, room diffusers, beautiful silk sachets, sleep masks and more. Their website (HERE) is an absolute delight to explore! Moving on from the packaging, lets talk about the body oils. These oils can be used on damp skin just before towel drying or they can be added to your bath water for a luxury bath. I mainly used the oil on my damp skin and loved it! My skin is super dry and the oil left my skin feeling soft and supple. The oils are winter must haves according to me! Vetiver is described on their website as follows: An original creation of heavy vetiver, balanced with light citrus tones and green tints of bergamot from the peels of nearly ripe fruit. I loved this scent too and I think it is a unisex scent. If you like strong woody scents, this is for you! Te is described as follows: Gracious, spirited, elegant. An enticing marriage of oriental black teas, juicy fresh Amalfi lemons, and the sweetness of almond honey. I find Te to be a crisp fresh scent which means I’ll be reaching for this in the spring summer time. The ingredient list is also simple and elegant, very much reflective of the brand as a whole. Overall, I am loving the body oils and would love to explore their other products. I think the 3 signature fragrances from Elizabeth W are unique and interesting in their own way. A DIY gift bundle such as this is a great gift for any one who loves trying out different scented bath and body products. So, if you have someone on your holiday list who loves perfumes and scented products, check out Elizabeth W.
Around the world via beauty products; Kissed by Maui lipsticks from Hawaii! I have been running this series on the blog for a while now and I am excited to bring you a brand which is from the home country 🙂 I have not been to Hawaii, but hope to visit at some point..but for the time being I am absolutely enjoying some lipsticks made by hand in Hawaii by the cruelty free brand Kissed by Maui. 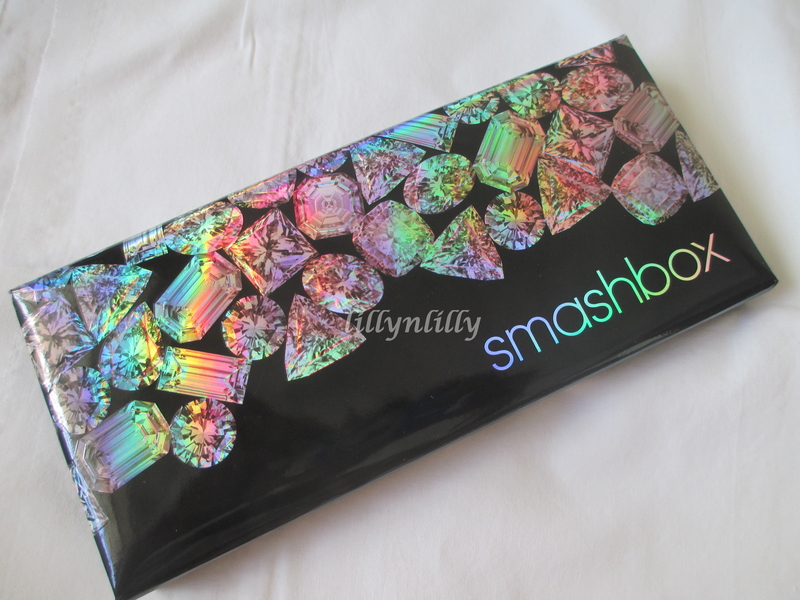 First off, lets take a moment to admire the packaging! 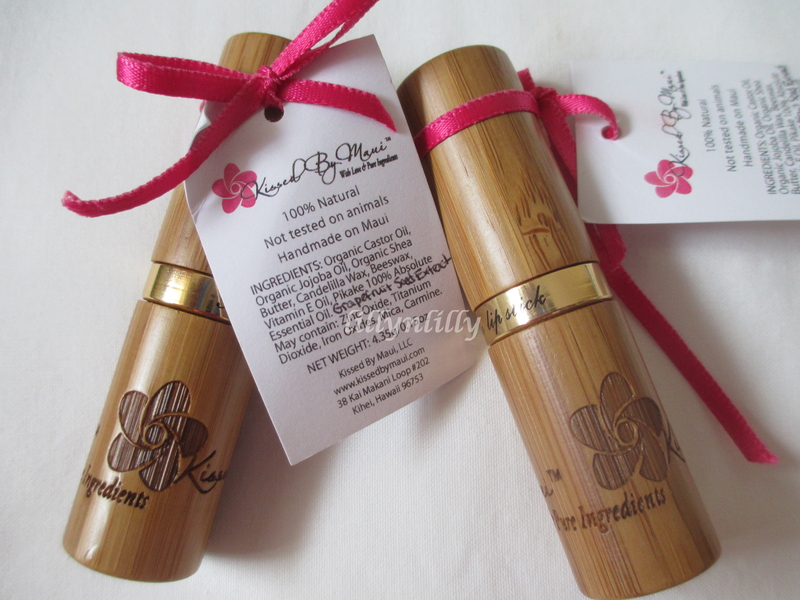 I love the sturdy bamboo tube with the brand name and logo engraved on the wood. They come with a pink ribbon around the lid along with the list of ingredients (which is an awesome ingredient list in my opinion..jojoba oil and shea butter are my favorite moisturizing agents). The 2 shades that I got are Paradise Pink and Haleakala Nights. Paradise Pink is your everyday blue toned pink lipstick which I feel might be one of their popular colors. It is the perfect shade for spring and summer! The second shade is not your average lipstick shade 😀 Take a look at Haleakala Nights! I really can’t think of any cons about these lipsticks. They apply beautifully and last 5 -6 hours with light eating and drinking. They have a creamy finish with a sheen (neither glossy nor matte) and do not dry my lips. In fact, I did wear Haleakala Lights without a lip balm underneath a couple of times and it was very comfortable! The date of manufacture is also listed underneath the tube of lipstick and I feel that is helpful when you want to keep a check on the expiry of your lip products (esp when you have plenty!!). Hope your having a great day! Until next time ciao!! 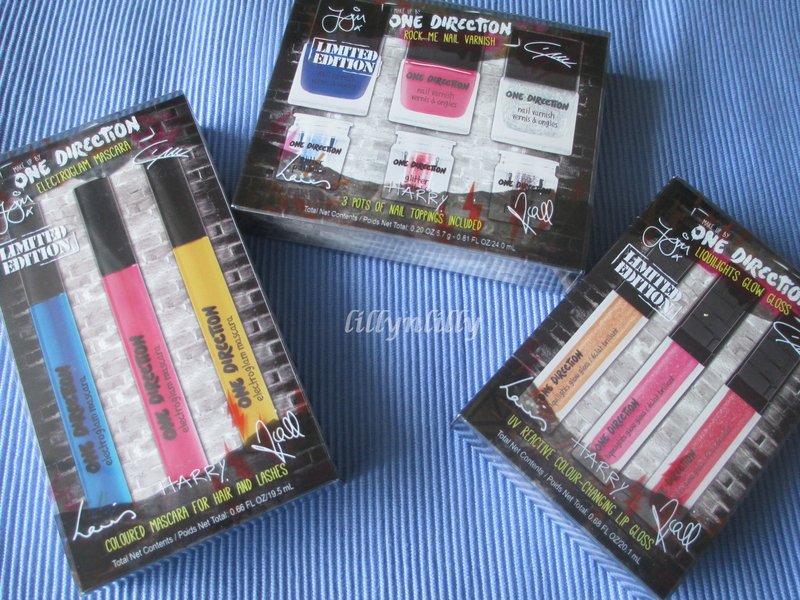 Holiday gift ideas for the One direction fan in your life! It’s December! Tis the season for family,shopping, gifts and food! I was sent these 3 holiday gift sets by Markwins which I think are the perfect stocking stuffers for the friend or family member who loves all things One Direction. I liked how the blue shade looked on my hair! The wand is a typical mascara wand and after stroking this onto your hair try to gently separate your hair strands with your fingers. 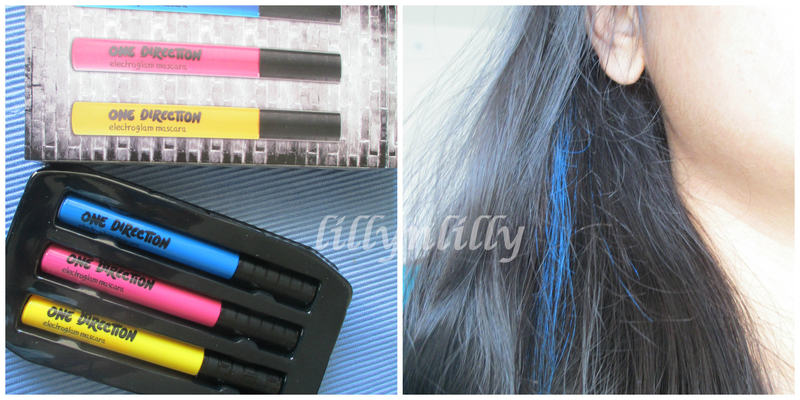 This will help distribute the color more evenly than by simply applying with the wand. This of course in no way compares to actually dying your hair blue but as far as temporary hair color goes , this looks decent. These come off really easy with a single shampoo wash so it is a nice way to add some color accents to your hair for an evening out. I like the formula of these glosses. They are non drying, non sticky and have no offense smells. The only thing I don’t like about them is the glitter! That is mostly since I am personally not a fan of glitter in lipglosses. The glitter also makes the gloss feel a tad bit gritty on the lips. This kit comprises of 3 nail varnishes and 3 pots of loose glitter. They suggest you sprinkle the glitter over wet polish. I tried this out and suggest that you apply an additional top coat post the glitter sprinkling step unless you like textured nails which get caught on every possible fabric! 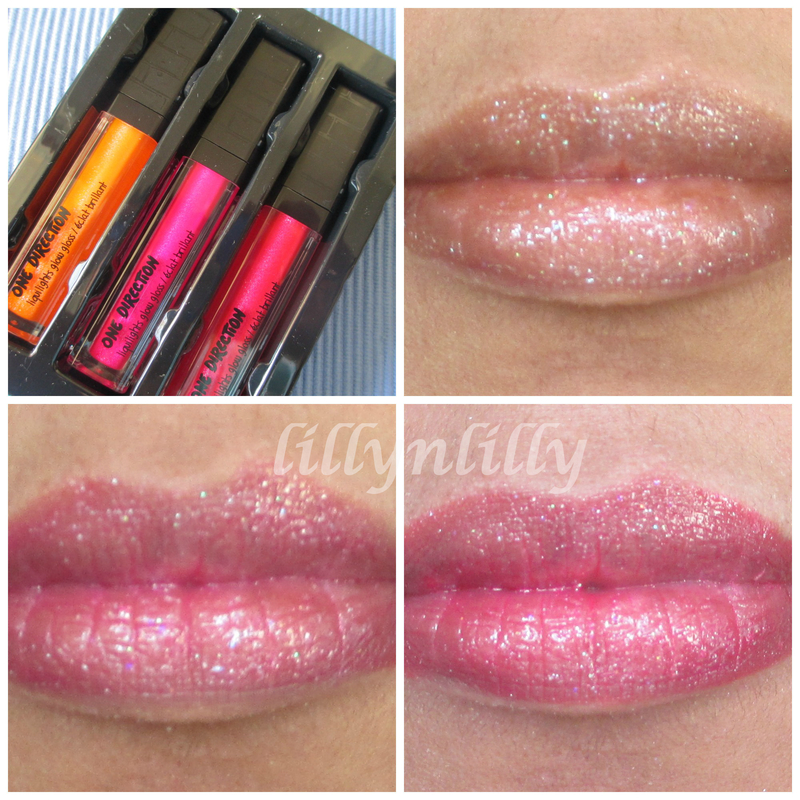 Like the lip glosses these too supposedly transform under black light. I found that the blue and pink nail varnishes needed 3 coats to look opaque on my nails. The silver glittery nail varnish however was able to deposit sufficient amounts of glitter in 1 coat. The glitter toppings are messy! So make sure your layout before you begin your manicure allows you to clean up glitter. Although the glitter toppings are messy and feel gritty on the nails they do look nice once applied. Have a great weekend! Until next time, ciao!! *PR Sample. Opinions expressed here are my own. 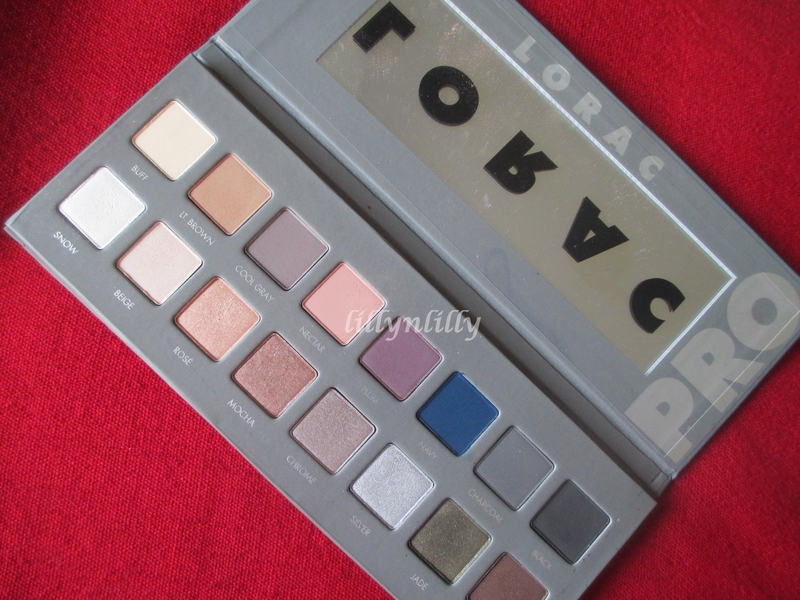 I got the Lorac Pro 2 palette a while back and have been playing around with it for 2 months now…aaaand I am finally ready to review it 🙂 I was on the verge of getting the Pro 1 palette when this was released and when I got a chance to compared them both in store I was drawn more to the Pro 2 palette since it contained shades I did not have in my collection. The Pro 1 looked really basic to me and I might get that at some point when I run out of basic shades (I have a feeling the wait will be really long for that to happen!). This is my first LORAC palette and I have to say I am blown away with the texture of these shadows! I know a lot of people don’t like the soft buttery texture which can crumble and get powdery if you man handle them with your brush, but to me they are perfect! Just make sure you don’t jab your brush into them! As you might be aware, the palette can be divided into the top row of mattes and the bottom row of shimmers/satin finishes. In terms of texture, all of these are excellent in my opinion. 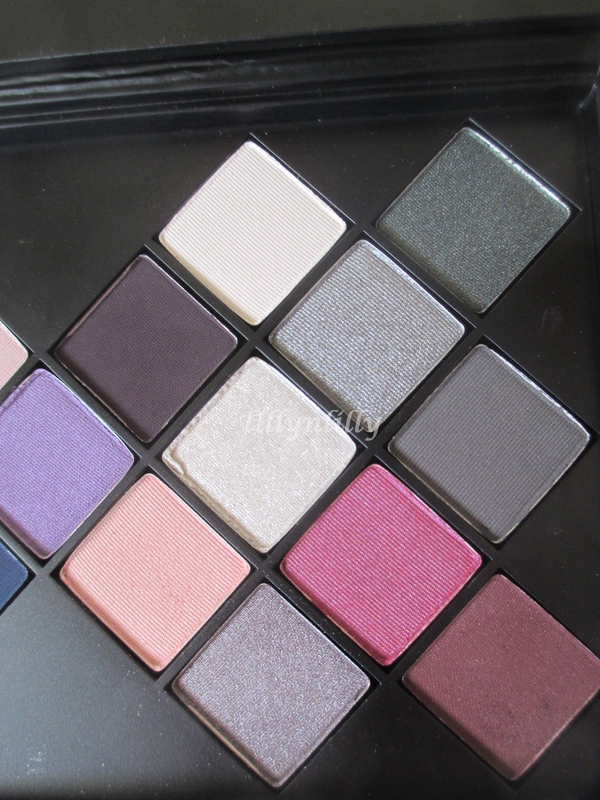 The mattes don’t feel chalky and the shimmers have little to no fall out since they don’t contain chunky glitter. I have heard people complaining about the shadows getting muddy when blending. I personally don’t do many complicated looks (I use 3 shadows max at one time) on a daily basis, so I did not have any issues with blending. In fact , I thought these shadows blended quite seamlessly for daily wear looks! I know you guys must have seen umpteen swatches of this palette online, one more set of swatches won’t hurt 😉 I do apologize for the not so great swatches though, since lighting has become an issue these days (I rely heavily on sunlight and where I am we don’t get much of it right now) ! The palette can also be divided into the slightly neutral side and the smokey side. These swatches are just a slight touch of my finger to my arm, and despite that they come through with their color. These shades above are very versatile and can be used for really basic looks. 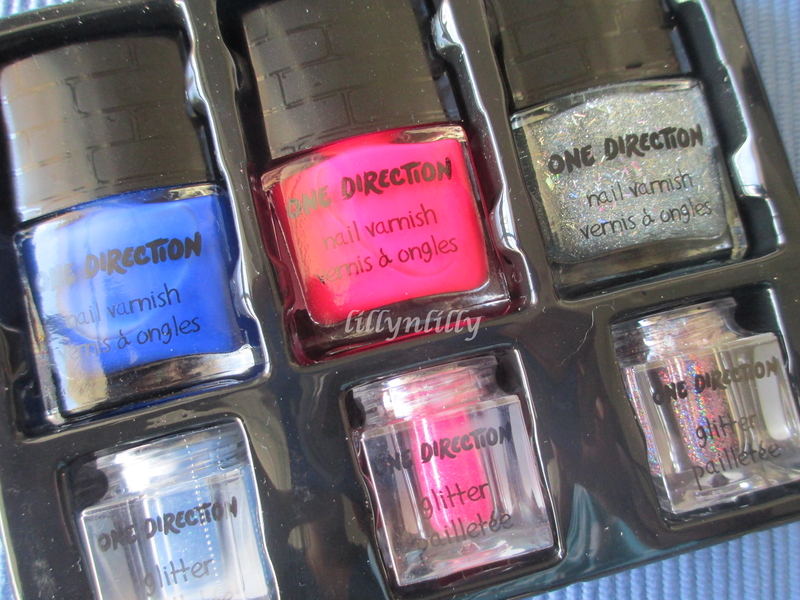 My favorites are the shimmer/satin shades! Rose is a lovely rose champagne color and Mocha is quite the stellar all over lid shade too! 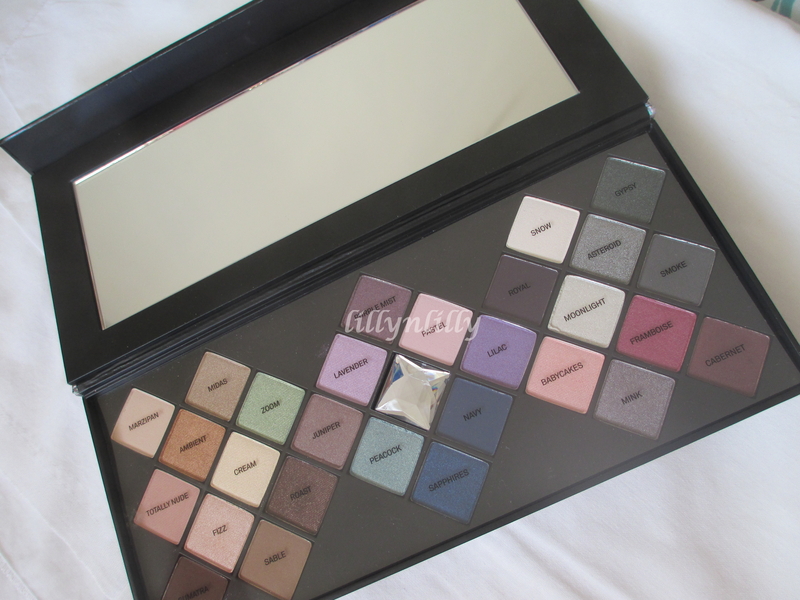 Navy was one of the shades that drew me to this palette! It is probably the only blue eye shadow I have which doesn’t apply like black on the lid. Plum is another really pretty matte shade, though it isn’t the best plum shade I own. I really love Chrome! Its a lovely satin taupe shade which would look great on anyone! 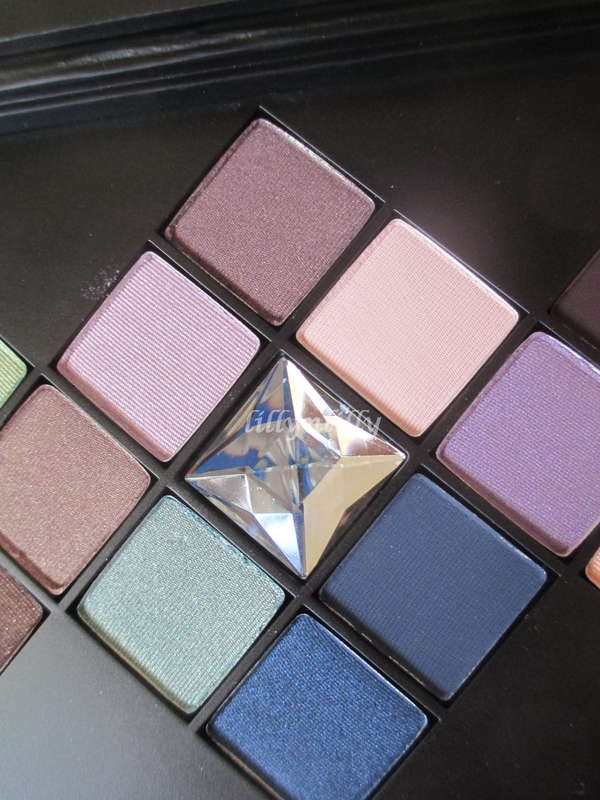 The only true dud shade for me in this palette was Jade. It swatches pretty but on the lid I don’t see any of that pretty green color I see in the pan. I also found charcoal to be a bit on the chalkier side but it is still workable. The packaging is sleek and storage friendly. However I am not sure if its sturdy enough to be popped into a bag with other random items and taken on the go especially since the shadows themselves are quite delicate. When this palette came out everyone classified this as a cool toned palette. 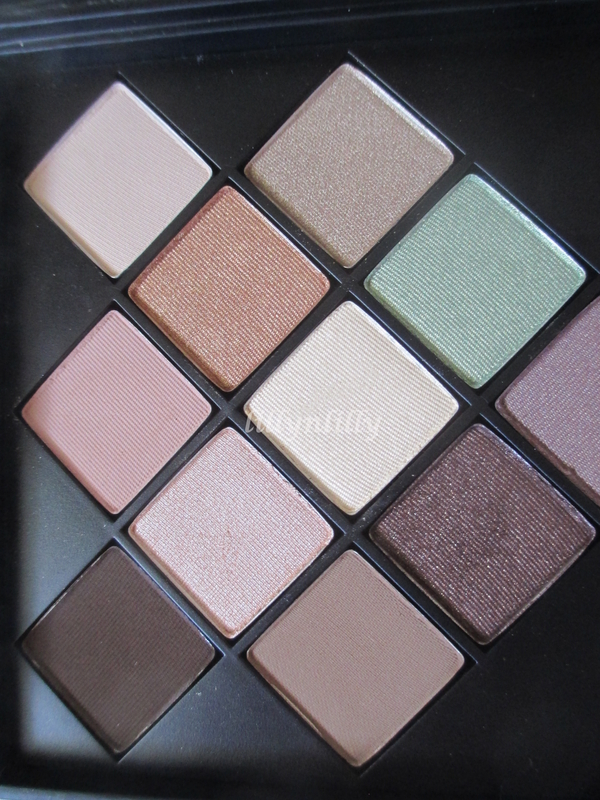 I however, feel at best this is more of a neutral leaning palette compared to the very warm LORAC PRO 1. I have yellow undertones and this palette was neither warm toned nor cool toned for my coloring (MAC NC 25-30). I am not sure how well some of these shades will perform on really dark skin tones but for the most part I think this palette can be used by a wide range of skin tones.